After reading an article about the rising trend in people writing their own obituaries, I thought this could be a novel way to assess your life goals and to see how close you are to achieving them. I know it sounds a little bit dark, but writing about what you want to be said could help to crystallise your future plans and give you a little motivation. If the world was to end today would you be happy with all that you have achieved? 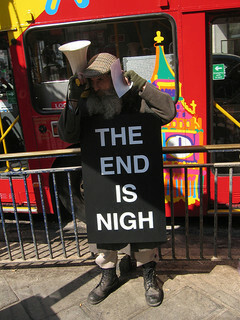 The end is Nigh – Jason Cartwright – What have you achieved? Now, I want you to do two things! Write a brief, honest obituary of what might be said if you dropped dead today. Let’s keep it to the section of the obituary that talks about your working life as that’s what’s important here. Once you’ve done that write another obituary of what you’d like to be said about your career when you die at what will hopefully be a ripe old age. Let’s call this your dream obituary, do you notice any differences? If you’ve approached this task honestly and there are some noticeable differences then with some hope you will now have a goal! Having a realistic and achievable goal is one of the corner stones of careers guidance, the bread and butter if you will. Once you have an end goal you can work on planning out the steps that you will need to take to get there. Once you have the plan you’re ready for the hard graft ahead. It’s easier said than done but this is when it’s time to roll your sleeves up, get your hands dirty and get stuck in! Are you ready? Did you dare give this a go? If so, did your dream obituary differ greatly from your current one? Why not get involved in the discussion below and let us know about your dream obituaries and the steps you’re going to take to reach your goals!